Swedoor has one of the widest internal door ranges in the market. Choose from high quality painted moulded doors to our purity solid shaker ranges. Our frame options complete the range including our unique FlexFrame system which makes installing doors a hassle free process. All the components are pre-cut and mitred making a professional fit. Our moulded door range feature both traditional and contemporary designs. With the option of glazed designs to let more light into your home. Doors are available as door only or in conjunction with our frame options. standard Swedoor construction of a honeycomb core with timber frame, makes it light, hard-wearing and reliable. This door is available in a wide range of paint finishes. This door has a completely smooth surface in an understated and contemporary design. It is available with glazing options and in a full range of colours. The door is manufactured with a honeycomb core and a timber frame, making it light, hard-wearing and reliable. Available as FD30 fire doors. Veneer finishes give you exquisite wood tones from a range of choices including birch, beech, oak, koto, mahogany and walnut. These are very stylish and will last beyond most design trends. Available as FD30 fire doors. The Purity door range, takes its inspiration from the Shaker style with pure lines. The door, framework and panelling are made from MDF with a foiled surface for excellent finish. The series consists of four basic models with one, two. three or four panels with matching glazed options. 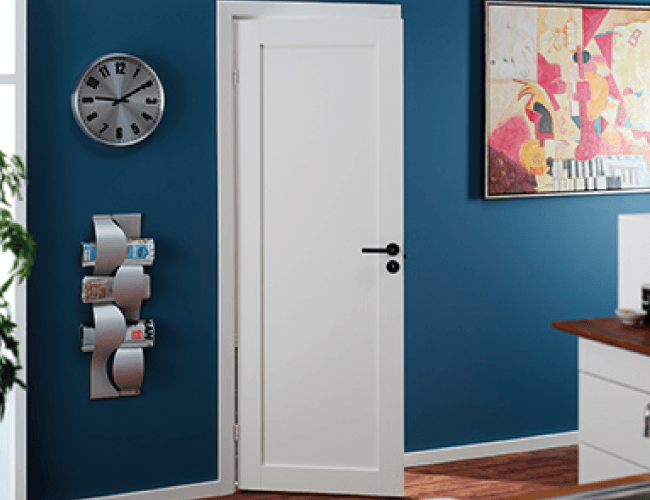 A Purity door is very stylish, giving a truly modern finish. Swedoor has also created additional practical uses for the Purity door range – a mirrored finish can be used in a bedroom, bathroom or guest room, and will increase the feeling of space in that room. The blackboard door could be useful in a kitchen setting, or for children’s bedrooms.